Vampire: Master of Darkness is an action game that was also released on the Sega Master System in 1993. Playing as Dr. Social, your mission is to locate the source of London's midnight murders, and rescue your colleague Miss Arkham. It consists of five rounds (with 1-3 levels each), and your main weapons are Daggers (1 point of damage), Sabers (2 points), Stakes (3 points) and Axes (4 points). Limited-use special weapons are also available in the form of a Pistol, Bombs, Boomerang, and a Projectile that wipes out multiple enemies in its path. 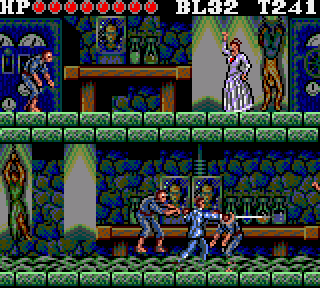 The gameplay is very similar to Castlevania (1987, NES), but it does feature a couple of significant improvements. Firstly, the controls are outstanding and I really like how you can adjust your jumps in mid-air, or whilst falling backwards after taking damage. Likewise, you can now leap while climbing stairs which is a massive help in avoiding damage and timing your attacks. Secondly, the level design is some of the best you'll find in any 8-bit game, due to the sheer variety that's been crammed into just five rounds. Highlights include battling along the Thames River while using boats to cross platforms, and the creepy Splatterhouse (1988, Arcades) style screens where waves of enemies must be cleared before you can progress! It's all smart, well-executed and diverse, while being a joy to play. The graphics are first-rate too (with little flourishes such as background posters blowing in the wind!) and the music manages to be both catchy and atmospheric. My only complaints are that the smaller screen size causes cheap shots from enemies that appear from out of nowhere, and you can't see the life metre of bosses (hereby taking away an element of strategy). There's no doubting that Vampire: Master of Darkness is a Castlevania clone, but it's a great game in its own right, with lots of improvements to the standard formula, as well as tight controls and fantastic level design. Although the Master System port plays better and is slightly more refined, this version is still well-worth hunting down. Random trivia: In Europe, the game was simply released as Master of Darkness.